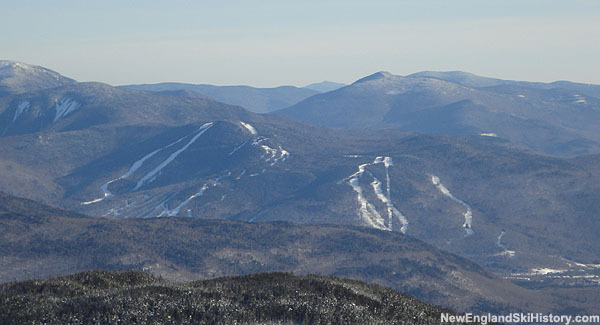 Located in Lincoln, New Hampshire, Loon Mountain Resort is one of the largest and most popular ski areas in New England. In the early 1960s, old mill town Lincoln, New Hampshire was on the verge of a drastic change. Spurred by President Dwight Eisenhower's Federal Aid Highway Act of 1956, Interstate 93 was being constructed from Boston to Lincoln. At the same time, the winter sport of alpine skiing was exploding in popularity. President Eisenhower's former Chief of Staff Sherman Adams grew up in Lincoln and went on to become President of the Dartmouth Outing Club and Governor of New Hampshire. Following his time in Washington, he returned to the White Mountains in search of a mountain on which to build a ski area. While Sawyer River Skiway looked like a compelling place to build a ski area, his longtime home of Lincoln seemed more promising due to improvements to the Kancamagus Highway, the expansion of Interstate 93, and the urging of his wife Rachel. 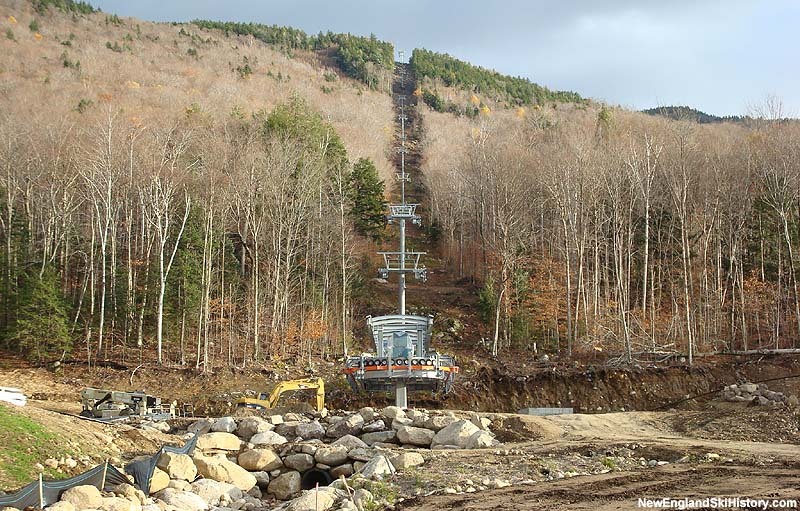 The $700,000 project started in the fall of 1965 with a trail and lift system designed by Sel Hannah, who aimed to provide novice and intermediate terrain primarily served by what would be New Hampshire's third gondola. While some had suggested building expert terrain east of the gondola, Hannah claimed the area would be too steep to hold snow. A veteran of the logging industry, Adams was hands on during construction, working nearly every day on the mountain. Adams even worked in a neck brace for weeks after being hit by a tree trunk in a dynamite mishap. Logging was handled by French Canadians in just two months, as 66 year old pushed them by being "the first on the mountain in the morning and last off at night." Adams often lamented, "I'm just a damned lumberjack." 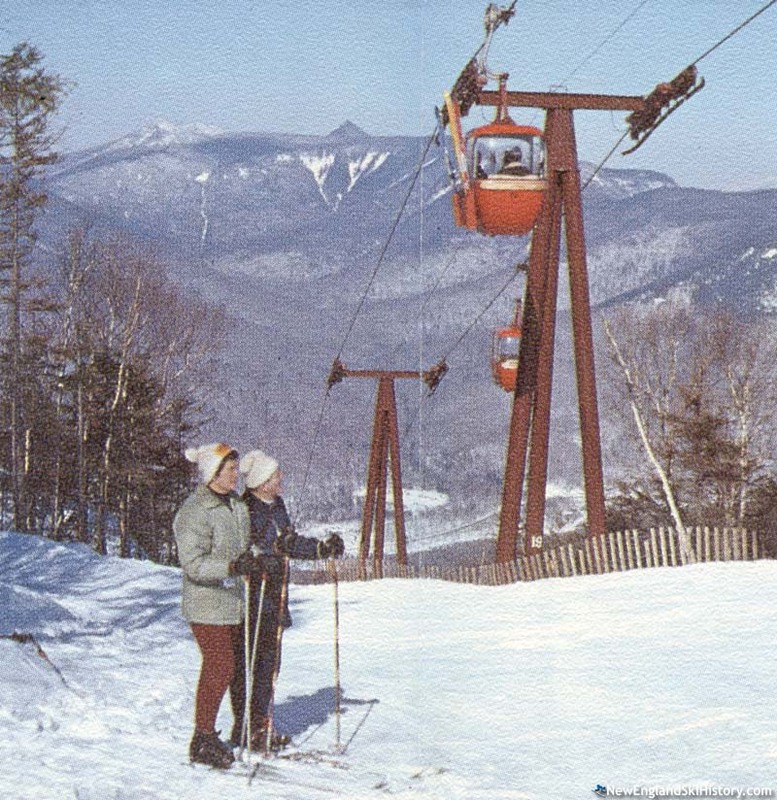 Alongside Waterville Valley, Loon debuted in December of 1966 with a dozen trails spanning 80 acres, served by a four person gondola and two double chairlifts. The 1,744 vertical foot gondola opened on December 27. 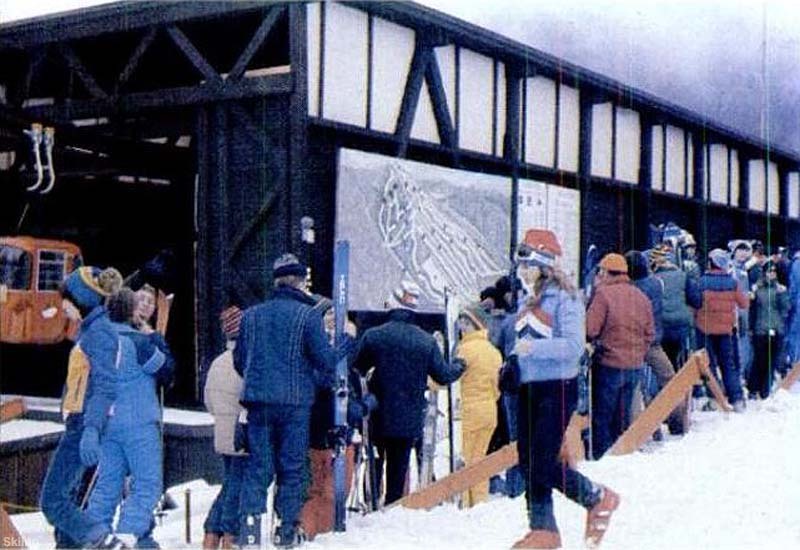 The new area featured a Carroll Reed ski shop and a Jon Putnam ski school. A new 45 room hotel debuted for the 1967-68 season adjacent to the base area, complete with a restaurant, lounge, and indoor swimming pool. After sometimes being referred to as 'Medicare Mountain' due to its largely intermediate and novice trail network, Loon expanded into the East Bowl (later known as the East Basin) for the 1968-69 season. A Hall double chairlift was installed to serve three new trails, as well as to provide an alternative way to get to the summit. Following a rough winter in 1969-70, Loon installed the first portion of its snowmaking system. Billed as a 'computer-controlled automatic operation,' the initial $200,000 installation covered 23 acres. Other changes for the 1970-71 season included the hiring of Colby Russell as General Manager and John Wilson as ski school director, taking the place of Jon Putnam who decided to return to school. The snowmaking system was expanded to 40 acres for the 1971-72 season. The capstone of the expanded system was a prayer rug with a snowflake and arrow design, created for Adams' office by his wife and daughter. To help transport skiers from distant parking spaces to the base lodge, as well as to provide an off season attraction, Adams acquired a wood burning locomotive named Old Pufferbelly in the early 1970s. Peek'n Peak and Gore Mountain manager Phil Gravink was named General Manager of Loon in 1977. The area's next big expansion took place starting in 1978-79, when the first phase of the West Basin was rolled out. Initially consisting of new terrain served by a new chairlift, a base lodge was constructed at the foot of the chairlift for the 1979-80 season, followed by a second West Basin chairlift for 1980-81. For the 1984-85 season, the $1.7 million North Peak area debuted, served by a triple chairlift. The new area also featured snowmaking and a lodge. Meanwhile, condominium development was in full swing with 730 units built by that time. Additional lower mountain chairlifts were installed for the 1985-86 and 1986-87 seasons. The 1986-87 season wound up being bittersweet, starting with the death of founder Sherman Adams in October. A few months later, on March 10, Loon crossed the 300,000 skier visit mark for its first time ever, putting it neck and neck with rival Waterville Valley. The two decade old gondola was replaced with a new Doppelmayr model for the 1988-89 season. Also around this time, Loon was working on what originally was to be a $27 million expansion project that included 7 lifts and 39 trails. While the 1986 proposal was scaled down in 1990, the eventual South Peak project was delayed for nearly two decades due to continued red tape, personal threats, and lawsuits. Phil Gravink departed in 1991, initially for Cannon and Sunapee and later Attitash. Sherman Adams' son Sam took on the title of President at Loon. Further modernization efforts took pace in the 1990s, including the replacement of the West Basin lifts with the area's first high speed detachable quad in 1995. Night tubing was added for the 1996-97 season. On February 26, 1998, Booth Creek acquired Loon Mountain for $29 million, bringing it under the same ownership as Cranmore and Waterville Valley. Longtime Loon employee Rick Kelley was named General Manager. North Peak received a new high speed detachable quad for the 2004-05 season. In January of 2007, Booth Creek sold Loon to CNL Income Properties, Inc., retaining operational control. Later that year, Boyne USA Resorts took over operational control and opened the long awaited South Peak complex. Though slowed due to economic issues, improvements were gradually deployed at South Peak in subsequent years. Meanwhile, the snowmaking system was greatly improved with more snowguns and a greater overall pumping capacity, allowing Loon to be a state leader in terms of early season terrain open. In June of 2014, the proposed new beginner area at South Peak was approved by the White Mountain National Forest, paving the way for future expansion. In April 2017, Ski Resort Holdings acquired the assets of Loon from CNL. Later that year, Jay Scambio was named General Manager of Loon. In May 2018, Boyne purchased the Ski Resort Holdings stake in Loon, placing the assets and operational control under one entity for the first time in a decade. "I worked at Loon from ‘67 -‘69. I taught in the ski school with Jon Putnam and coached kids in the race program. During the off season I worked on the trail crew, did construction and anything Sherman Adams needed done. It was the beginning of my 40 year career in skiing. Great memories." "I so loved Loon Mountain when it first opened. I was six years old our first winter going there. My parents were avid skiers. They would drive my brother, sister and I to Loon early on Saturday morning. We would ski our hearts out the entire day, and then get back the back for the very long ride home. Then we would do the same thing again on Sunday. Thx mom and dad! I have the best memories of those days!"